Charles Dickens wrote a great novel entitled: The Tale of Two Cities. We could borrow some of that title for our feast today and call today the Tale of Two hearts. Yesterday’s Solemnity of the Sacred Heart of Jesus and today’s feast of the Immaculate Heart of Mary. Through these two hearts, God has drawn countless souls to himself. We pray that their hearts will reign and triumph over all for the salvation of our souls and the whole world. Since my own childhood, perhaps like many of you, I grew up with a strong devotion to both the Sacred Heart and the Immaculate Heart. I recall often our parish priest inviting us to pray the litany of the Sacred Heart of Jesus, repeating with ever greater intensity, “heart of Jesus,” “heart of Jesus,” and the prayer of reparation and consecration. Many a home is enshrined with the statues of the Sacred Heart of Jesus and the Immaculate Heart of Mary. The Sacred Heart and the Immaculate Heart have watched over many a home from those little ledges. The tale of two hearts is a tale of the illogical and incomprehensible love of God for us. We cannot explain why God loves us so much. The heart of Jesus and the immaculate heart of Mary then are shrines of this divine love. They both, to their own degree, one by the God man and one by the perfect vessel of grace, reflect and mirror for us this most central of all beliefs that God is love. Try as hard as we may, we simply cannot explain the reasons for this, for God should have given up on our humanity long ago, but he didn’t. Perhaps, we will never know the reasons until we get to heaven. I recall the 17th century philosopher Blaise Pascal, who at the end of this life wrote this timeless truth: The heart has reasons of which reason knows nothing. No truer words have ever been spoken especially as they relate to the Tale of these two hearts. 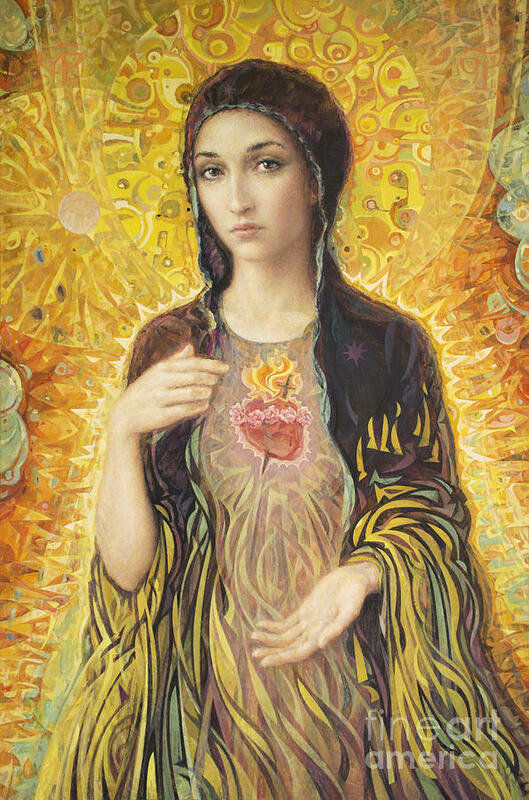 Mary inspires us to keep our hearts set on God, as God’s heart is set on us. Today in this Eucharist, on the Feast of the Immaculate Heart of Mary, Jesus knocks at the door of our heart. In us, He wishes to take up His abode and, through our body, enter human history. When we welcome Him, He gives birth to divinity within our hearts. “You have heard, O Virgin, that you will conceive and bear a son; you have heard that it will not be by man but by the Holy Spirit. The angel awaits an answer … we too are waiting. On your word depends comfort for the wretched, ransom for the captive, freedom for the condemned, indeed, salvation for all the sons of Adam, the whole of your race. Answer quickly, O Virgin … Speak your own word, conceive the divine Word. Open your heart to faith, O blessed Virgin, your lips to praise, your womb to the Creator. See, the desired of all nations is at your door, knocking to enter.